Help your child sharpen her math skills with this double digit addition regrouping worksheet. Cute monsters will look around while she solves the problems. Available in two versions: in color and black&white. Is your child struggling with two-digit addition? Learn how to teach your child vertical strategy. Bonus! Teaching chart included. 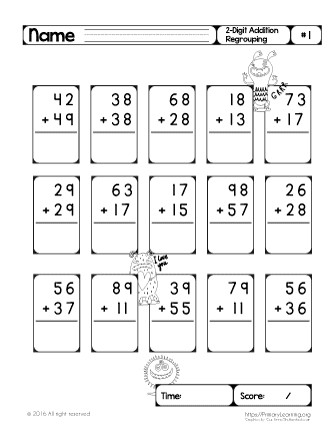 See in the book: Monster Math | Two digit Addition.